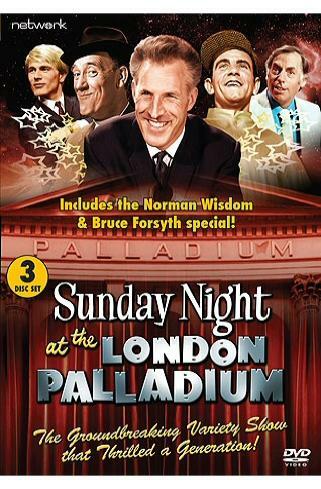 Making its debut on ITV's opening weekend in 1955, Sunday Night at the London Palladium swiftly established itself as one of the weekly televisual highlights for the British viewing public. Gaining average viewing figures of 14 million viewers and Top Ten placings almost every week, it is undoubtedly one of the main shows that helped establish commercial television in the UK. Lasting fourteen years until 1969 - and with a revival series in the mid '70s - the show was hosted by a number of performers, including Tommy Trinder, Bruce Forsyth and Jimmy Tarbuck. This was weekly event television that transcended all classes, denominations and age groups - an unquestionable success which still provides a high benchmark that today's variety shows can only aspire to. This DVD set - released to celebrate the London Palladium's centenary - contains some of the best of what little remains in the archives for the original run from the 1950s and '60s. It also includes the special two-hander show from February 1961 that featured only Norman Wisdom and Bruce Forsyth, alongside some of the remaining shows from the 1970s revival. These editions include Beryl Reid, Adam Faith playing with the John Barry Seven, Bobby Darin, Cleo Laine, Pink & Perky, Sarah Vaughan, Freddie and the Dreamers, Mario Lanza, Larry Grayson, Jim Dale, Paul Anka, Rod Hull and Emu, Ted Rogers, Sacha Distel, Cliff Richard, Bob Monkhouse, Clodagh Rodgers and many more.